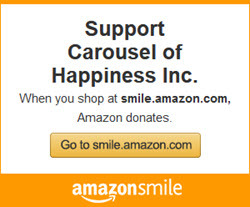 The Carousel of Happiness is celebrating that two of its most lovable celebrities have eloped! 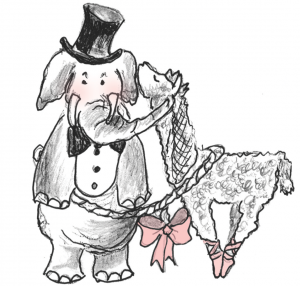 Miss Zparkler, the alpaca and Eli Phant Jr., the elephant, were married at the Justice of the Peacetime sometime in June. 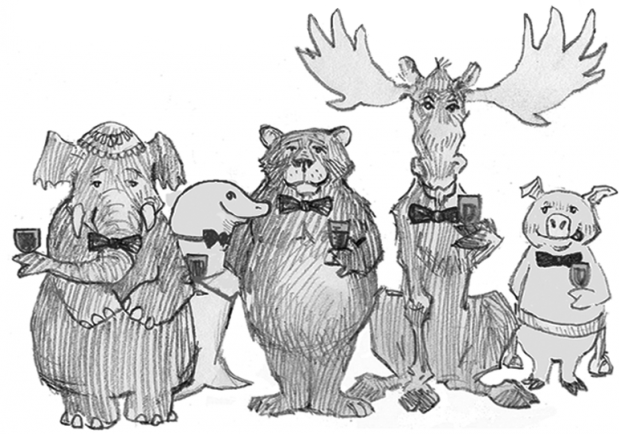 To mark the exciting occasion, the parents, Mr. and Mrs. Al Paca and Mr. and Mrs. Eli Phant Sr. are inviting all to a Ned-style black tie reception and Carousel fundraiser at the Carousel of Happiness, Saturday, July 23, from 7 to 1 0p.m. and everyone is invited. “They have been going around together for 6 years now, so it seemed only appropriate that they finally tie the knot”, said Mrs. Al Paca, Zparkler’s mother. “We are excited to have the reception as a fundraiser for the Carousel and hope everyone can join in the festivities”, she added. The family is asking for donations to the Carousel for those that can’t attend and may want to acknowledge this happy occasion. The reception will be a catered event, with live music entertainment and a silent auction. A gift of $50 for 1 guest or $85 for 2 guests is requested of those planning to attend. ($40 for each guest over 2) You can pay in advance using the tickets below, or at the door but space is limited, so please plan to rsvp or pay in advance.